This recipe combines two of my favorite things, lentils and sweet potatoes! 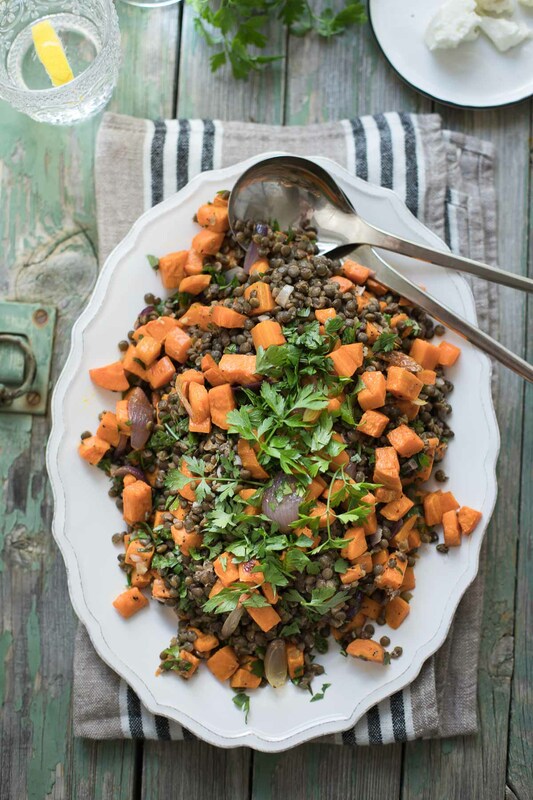 But actually this sweet potato lentil salad is so much more than that. Along with the sweet potatoes, are carrots, red onion and a pinch of dried chili flakes — all roasted together to bring out their sweet and caramelised flavor. The exact thing, that is such a tasty trio with my favorite lentils, plus fresh parsley and sprinkling of Greek feta cheese. Oh yeah, then there’s the dressing. A poppy-seed dressing. Not the creamy kind, but sort of like my go-to French dressing, with a little honey AND instead of red wine vinegar, this one is with apple cider vinegar. LOVE it! I’ll also tell you that this dressing is terrific with a spinach salad. My favorite, a simple spinach salad with sweet red pepper, blanched green beans, tossed with THIS poppy-seed dressing and then topped with roasted cubed sweet potato, plus toasted almond slivers. So delicious. And something I should really put on the blog. Yeah, I am seriously addicted to salads. So here’s to introducing a new go-to for a quick and healthy weeknight dinner. 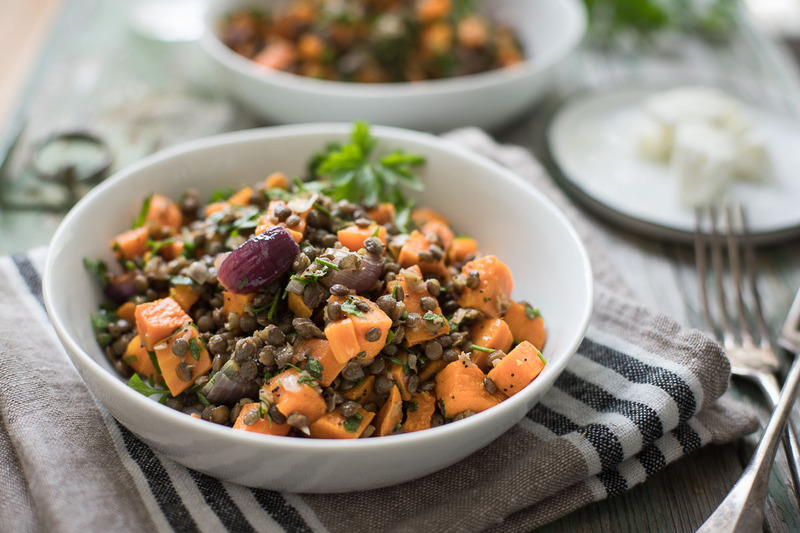 This sweet potato lentil salad can be eaten warm, room temperature or cold. Which is also why it makes great leftovers. 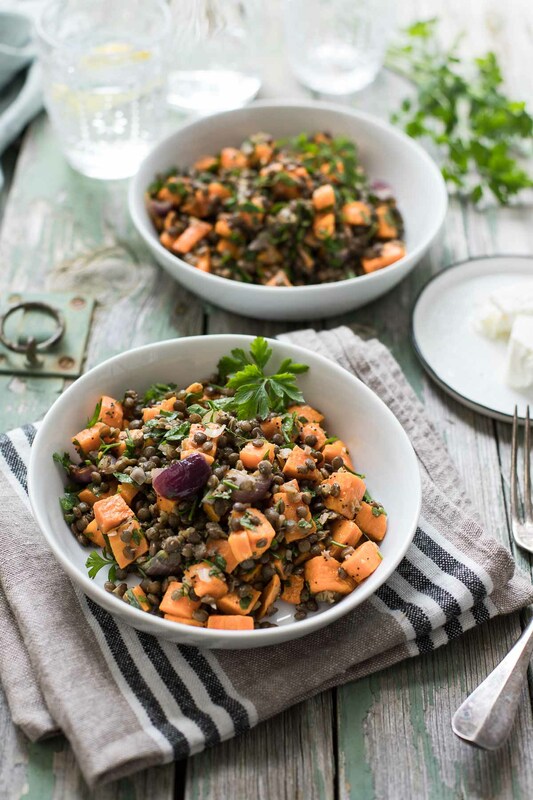 Hearty green lentils with roasted sweet potatoes, carrots and red onion is the perfect combination of flavour and texture. A sprinkling of feta finishes off. And if you are looking for a little crunch feel free to top with toasted pumpkin seeds or almonds. The feta cheese is totally optional, but I love the flavor it adds. If you want to keep things dairy-free or vegan, you can leave it out. Enjoy! A super easy and delicious salad that can be enjoyed, warm or at room temperature. 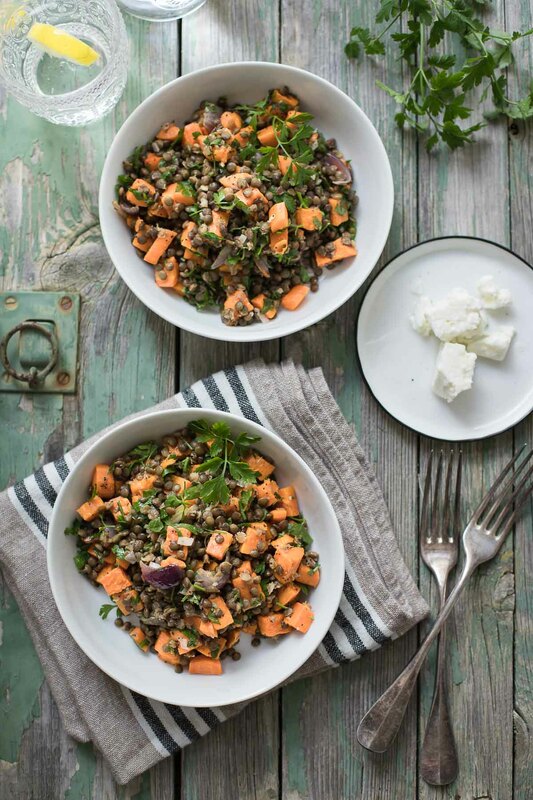 The combination of sweet potatoes and lentils creates a dish that is both filling and healthy. Plus it works well as a side or a main. Naturally gluten-free and easily made vegan by omitting the feta cheese. Cook lentils according to package instructions for 20-25 minutes, until al dente. Drain and set aside to cool slightly. Meanwhile, preheat the oven to 220°C and line a baking tray with parchment paper. Transfer the carrots, sweet potato and red onion to the prepared baking tray, drizzle with olive oil and toss until evenly coated. Sprinkle with the chilli flakes, and season with salt and pepper. Roast for 25-30 mins, tossing halfway through, or until tender and turning golden. NOTE: careful not to crowd the carrots and sweet potatoes, otherwise they will steam instead of roast. If needed, roast on 2 baking sheets, changing positions halfway through roasting time. Meanwhile, prepare the dressing. Add all the dressing ingredients to a small bowl and whisk together until combined. Transfer the lentils and parsley to large serving bowl. Pour over the dressing and toss well, then add the roasted vegetables and toss gently to combine. Transfer to a serving platter or into bowls and top with crumbled feta (if using) and more parsley to garnish. Serve and enjoy! Look for feta made in Greece — it’s the only one that is REAL feta. My favroite is made 85% sheep’s milk and 15% goat’s milk and comes from the Greek island of Lesbos. This is the real stuff and it holds the PDO (Protected Designation of Origin) to prove it. This means it is produced regionally, the traditional way, using free-grazing native sheep and goats. Otherwise, my other favorite choice for this salad is Chevre goat cheese. I use acacia honey, as it has a light and delicate taste which allows the flavors of other ingredients to shine through. 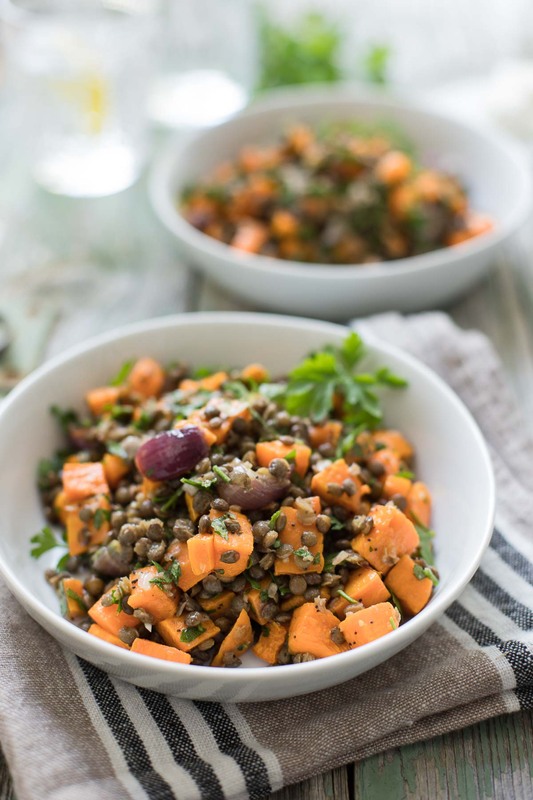 If you make this Roasted Sweet Potato Lentil Salad recipe, I’d love to hear how it turned out for you! Be sure to rate it and leave a comment below to let me know! Especially if you have tips for other readers. Or take a picture and tag me on Instagram @ellerepublic and don’t foget to hashtag #ellerepublic so I don’t miss it!